Even so, I wasn’t so excited that I forgot that the media has its own agenda and twists things to meet its own purposes. I asked specifically what the focus of the article was going to be and said that I did not want to be part of an article that was just a smear against owners of exotic pets. I was told that the article would be about the animal-human bond but focusing on exotic animals. Great! I’m in. See that cute little hedgehog on the cover? Yes, those are exotic animals. So are hamsters, guinea pigs, prairie dogs, sugar gliders, gerbils and ferrets. Even rabbits are considered exotics. So was the article about that? Did the article focus on responsible ownership of exotic pets? Did it cover the process of domesticating a new animal species to be a pet? No, it did not. Though anyone can own a cat or a dog, exotic pet owners take pleasure in possessing an animal that has, for hundreds of thousands of years, refused the saddle of domestication. That is…well, there’s no polite way to say what that is. Did sugar gliders and gerbils “resist the saddle of domestication?” What about that hedgehog on their cover? Or was it just that people did not have the free time or resources to domesticate those animals previously? What about capybaras that are farmed/ranched within their range in South America? Are they really “resisting the saddle of domestication?” Isn’t hat language both emotionally charged and misleading? Conservation efforts should focus on protecting animals in the wild, they [ WWF and Free USA] assert, not on preserving what are often inbred animals in private zoos. I have a whole lot of problems with that. Firstly, as long as the human population continues to rise–and it shows no sign of slowing let alone stopping–wild animals are going to be going extinct. The “wild” becomes smaller and smaller every year and there is no place on land or seathat has not felt the destructive influence of humankind. Secondly, there are a lot of exotics, like capybaras, that are getting little or no protection in the wild because they are IUCN species of least concern. Right now, there are still lots of them. They are hunted for both meat and leather, they are farmed and ranched. They are sometimes treated like vermin. So exactly what harm do a few pet capybaras do to the wild populations? Show me some data. I do agree that captive exotics are sometimes highly inbred. But so are dogs, cats, cattle, pigs, horses, chickens. In fact all domestic animals are inbred. That’s how we developed the different breeds of animals in the first place. I own three American Quarter Horses. One common term you’ll see in an ad for an expensive AQH is “line-bred.” That is absolutely a less pejorative form of the term in-bred. Why do some breeds of dogs get hip dysplasia? Why do some quarter horses carry a gene that causes their skin to slough off. These are ugly, horrible side effects of inbreeding, but they are not restricted to exotics. Domestication is a process. It starts with a wild animal and after some number of years/generations, it produces a domestic animal. I think that capybaras are great candidates for domestication. Rather than comparing them to tigers or chimps or lemurs or other dangerous or threatened animals, why not compare them to their close relatives, the guinea pigs? Guinea pigs do fine in captivity and rather than being classified as exotics, they really should be termed domesticated animals. There is no reason to believe that a few generations of captive breeding of capybaras would not have the same result. Here are the contents of an email that I sent today to the editor I dealt with at National Geographic Magazine. Melanie Typaldos bought a capybara after seeing them in the wild in Venezuela, but the rodents tend to die young in captivity. Her first died of liver failure. Garibaldi Rous, her second (right), came to her with many medical issues. After her first capybara died of liver failure, Melanie typaldos bought Garibaldi Rous. The Texas was attracted to the giant rodents, which tend to die in captivity, after seeing wild ones in Venezuela. It doesn’t take a rocket scientist to realize that these texts differ both in content and in character, even aside from the fact that the printed version is factually inaccurate. I did not buy Garibaldi Rous. I adopted him from his previous owners who decided, correctly, that they were not up to caring for an exotic animal like a capybara. Further, what I said is that capybaras raised in captivity tend to die young. That is much different from saying that capybaras die in captivity. For one thing, all animals die so that goes without saying. But more importantly, your phrasing suggests that bringing a capybara into captivity causes it to die. This is not true and it is not something that I said or implied. Lastly, I would like to say that I made it clear before I agreed to the photo shoot that I was not interested in participating in an article that was just just going to be more ranting about how animals belong in the wild and that exotics are not meant as pets. I was duped into this and I am extremely angry. I notice that I was not quoted anywhere else in the article, probably because my views, my treatment of my animals, the charity I started to help understand capybara veterinary needs (ROUS Foundation for Capybara Veterinary Medicine) did not fit with your intended negative spin on exotic pets. I had thought that National Geographic was a reputable magazine doing actual reporting and investigating. How wrong I was! And to think that I took the time to talk to these people two weeks after having major brain surgery! I couldn’t even see at that time. I could hardly feed myself. But I took time out so that I could tell people the world over what wonderful, loving animals capybaras are. How unique their personalities are. How the world isn’t just dogs and cats. I’m sure I got a great photo of me and Garibaldi out of it but, sadly, due to brain damage from my stoke, I no longer really understand photographs. I look at it and, after a while, I can see that it is me and Gari. But photos no longer carry any emotional significance to me. I miss Gari. I hoped this article would be a lasting legacy for him. Instead, I think he would be just as angry about it as I am. I will probably write more on this topic when I am calmer about it. Brain damage seems to have made me an angrier person than I used to be. I would also have expected National Geographic to take a more scientific, investigative approach to the subject than this. I am so sorry they have distressed you. well I invite those idiots to my farm…not all capybaras die young..Captain was almost 18 years old and lived in my back yard. I have one that died a couple years ago that was 17..have one that is 17 and blind and lives the life of luxury at my farm…my capys have land to roam but not in the wild and are fed food every day because they are grass eaters and I do not have that much grass. I would really love to talk to those people. Sorry Mel that you had to deal with that. I bet theu would really enjoy the fact that I have a 144 pund blood hound dog that lives in the house..the only thing she tracks is the food bowl and animal crackers. well I invite those idiots to my farm…not all capybaras die young..Captain was almost 18 years old and lived in my back yard. I have one that died a couple years ago that was 17..have one that is 17 and blind and lives the life of luxury at my farm…my capys have land to roam but not in the wild and are fed food every day because they are grass eaters and I do not have that much grass. I would really love to talk to those people. Sorry Mel that you had to deal with that. I bet they would really enjoy the fact that I have a 144 pound blood hound dog that lives in the house..the only thing she tracks is the food bowl and animal crackers. Downright Disgraceful what National Geographic did. They are more and more being like National Enquirer than what they fooled all of us to believe wat they stand for. Just a Shame. Hi Melanie, I suffered a brain injury from a car accident almost 20 years ago. Anger is a natural part of the healing process but it will not always feel so extreme. This report about NG makes me angry as an animal lover, former journalist, and admirer of your passion for the capys. I’m especially sorry when writers can’t be trusted. It’s a poor storyteller who has to change the story. I adopted my guinea pig girls after my kitties Calder and Boo died. Both Lola and Gigi were given up by families who couldn’t make time for them anymore. I wouldn’t have considered these sweet little rodents without having learned about their giant relatives from you, Caplin and Gari. Hang in there. Your influence has been greater than this poor article. Skunked again. It should be so easy to write a factual article, but almost every one of these people prefer to create a sensational article. One more reason to resist the lure of free media publicity and publish your own articles and books. Melanie, you did exactly the right thing by defending what you actually said in the Nat Geo article. I wish I could say I’m surprised by what they did. Unfortunately I am not. Your anger is justified and shared by your many loyal supporters. What angers me most is the article COULD have been a lasting tribute to Gari and other exotic animals. Shame on you Nat Geo!! Stupidheads! If you have a written agreement then I suppose you may be able to have a retraction printed in the next issue. An apology would certainly be welcome as well. That is damn low for a magaazine i have read and love to read more. this is and will be a stain that does not and will not be able for them to wash off easily. they potray animals as emotionless beings with alot of training…. 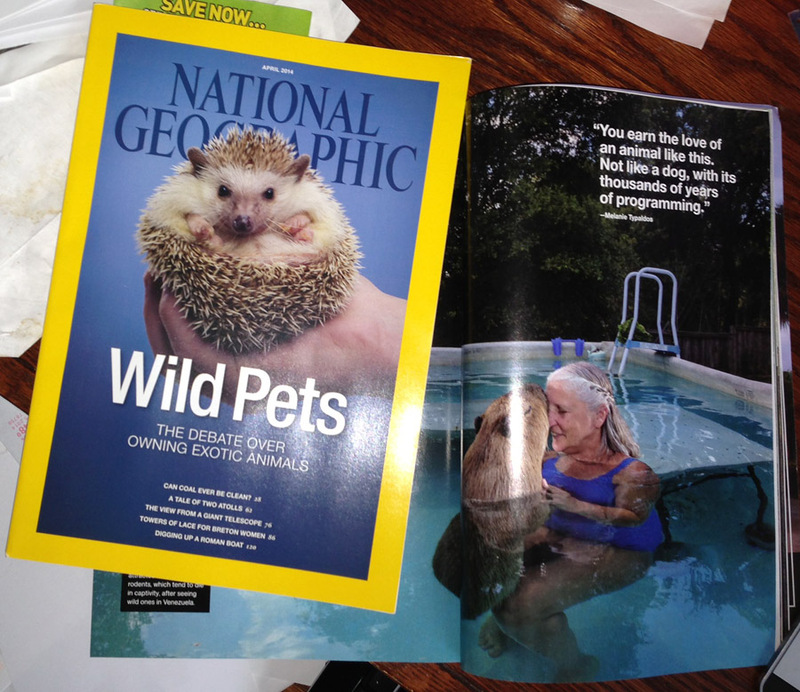 I am also very disappointed in National Geographic. They have done many good things, but this is a definite low point. When I get my issue (I am in Europe, so it will take some time) I will make sure to write a letter-to-the-editor stating my displeasure. Thank you for all you have done and are doing for Capybaras. Great summary! I too would have thought more of NG and did raise an eye brow when I saw the photo and read the text the other day. Gosh – I wonder if NG would consider rabbits exotic! Where do you draw the line? What about chinchillas? Having two rabbits and a chin, who I think actually live longer in captivity, I have to wonder about the classification of exotics. I agree, since humans are overpopulating the planet and eating all the food, we are rapidly crowding out our other animals. Most of the planet’s animals will be a curiosity soon. Yes there are examples of overpopulation (e.g., deer in some areas), but we have long managed populations without a lot of knowledge. Any knowledge we can gain from living with different species is a good thing. I don’t have my copy yet (via subscription). Will read it carefully for tone, and respond to them. Sorry that pictures do not reveal to you in your new condition. The past years of your postings on FB have added so much to my life, and I’m very appreciative of your work, your family, and your wonderful writing skills. I think you have every right to sue them for misrepresentation of facts. And for them to place a retraction and the correct text previously agreed upon in the letters to the editor section. They really mangled the agreed-upon text! It really does put a different spin on your relationship with your capys. I’d be angry, too. Journalism standards are really falling if it’s gotten to NatGeo, a formerly reputable magazine. Wow!! I’m so sorry that this happened!! I’m angry too!! Melanie, I am also angry with them. Unfortunately, when people have AGENDA, they forget to follow the facts, and they loose any decency. And you are absolutely right in what you say in this post about domestication. Let me remind you that great Gerald Darrel was holding the similar views – that animals in wilderness do not always have better lives. As for domestication, remember, I wrote to you recently: “Capybaras are naturally friendly, curious and playful, and they do not fear people. I think they are the best candidates for domestication, and I think you’ll agree with me. Beyond that, they have sense of humor and some special dignity”. Melly, I would be very angry at the people of Nation Geographic. Gari and Caplin were so lucky to have you loving them and teaching all of us about Capy’s. I know that my daycare children still talk about Gari and they get out the Gari puzzles and when they finish they cheer ” HI GARI! ” There must be some legal action you can take for misrepresentation. Those people were obviously only concerned with THEIR so called facts. We are so glad that we had the chance to watch Caplin and Gari grow and all their silliness 🙂 I am glad that you wrote to not buy their magazine because I get a copy every month for the kids. This is *terrible*. I am so sorry this happened to you, and no doubt to the other people who contributed their experiences. Melanie, I am very sorry for this. I completely support you and will not buy any National Geographic copies. I would be very curious to see the response from the editor to your email though! I am absolutely disgusted at NG for this and what they have done to you! The article doesn’t appear factual or scientific at all, I honestly would have expected more for NG. Looks like they will be loosing several customers over this. I know you say you have having difficulty processing the photo of you an Gari, so I thought I would tell you what I see when I look at it: The photo of you and Gari is simply gorgeous, it is peaceful and beautiful, there is so much love between the two of you, it radiates from the page. His posture shows how comfortable he is around you and how much comfort you give each other, his sweet rodent lips look like he is kissing your forehead, so full of sweet and innocent love from such a perfect creature. And how you are leaning into him, its all just so comfortable, so lovely and so perfect. Anyone reading the article will be hard-pressed not to see the love between you two. That is just awful. National Geographic was one of the few magazines I actually enjoyed. My kids still have a subscription to National Geographic Kids. I don’t think I’ll be renewing that. I had something like this happen to me when I was in college. My college wanted to do an article on non-traditional students. I transferred there from a rival school because my husband got a better job and I didn’t want to drive three hours one-way to go to class. They used the article to further the rivalry by saying I transferred due to harassment, which was the farthest thing from the truth. It hurt and it made me mad. And this was just a stupid, college paper. I can’t imagine how hurt and angry you are over an international publication twisting your words like that. I’m sending positive thoughts your way. Gari’s memory deserves better than that, and you as an exotics owner deserve better, too. Let this be a warning to others contemplating being part of a story in this magazine. I have seen a major change in so many magazines. If you compare the NG from the sixties, that I grew up with loving the factual stories, to the ones in the 90’s, when I stopped reading it. You will find a major shift. While most stories were factual they were becoming a media driven sensationalized rag. SELL SELL SELL is the driving force. Not report the facts as you find them. Now I find I am going to have to read NG one more time and then will send a letter similar to this as to why I will no longer read it. You want things to change. Write letters to the mags and to the news networks. FACTS FACTS FACTS not innuendo or yellow journalism. I think what happened in this article bears a great deal of similarity to what happened with the film, Blackfish. Then there is another film, Parrots Confidential. These films are being produced and articles written to propagandize the general public into supporting the idea that NONE of these birds or animals belong in our lives, in our homes and in our facilities. This is not an accidental event…it is purposeful. There is an agenda to remove animals from humans, and it includes even animal agriculture. Those who wrote the article are working on that agenda, cleverly, and they use responsible caring animal owners in these articles and films in their efforts to pave the way for anti-exotic ownership. Be warned that there will be more to come. Animal owners need to support each other. It is important to support our right to keep and breed animals as long as we are responsible in providing appropriate care. Mel, I am so sorry about what they did to you. It’s awful. Once upon a time, I was contacted by a woman who said she was doing a tv show for the discovery channel, or animal planet, one or the other, and they wanted to send me a video camera,have me take some video of my life with the rabbit rescue I ran and that maybe they’d feature us on a story about a person who manages a full time life as well as a lot of animals. (At the time, I was a police officer). I had friends give me a hand filming shots of all the bunnies, my homes,my dogs, etc. Imagine how shocked I was six months later when I found out THE TV SHOW WHO’D tried to TRICK me into “being featured” was HOARDERS. Amazing the b.s. people will pull to get a “story”. Unreal. I’m so sorry they published such derogatory info about the potential of capybaras. I’m sure a lot of the capybara health problems seen in the North American captive population have happened simply because until now, most of the useful info was only available in Portuguese or Spanish. The recent book: Capybaras: Biology of a Unique Neotropical Species tells exactly what to feed capybaras at various stages of life and even has the email addresses to the experts embedded in the text! Sure, it costs $170, but you can rent it or if you decide to be a serious breeder, it will be worth every penny. I’m sure if the ROUS foundation had the kind of funding the Venezuelan capybara research has, American capybaras would have a longer, healthier life. They wanted to say what they wanted to say, and they, like most media, didn’t care who they hurt in order to say it. The love Gari experienced – and I truly believe, returned – is so obvious from your writing, photos, etc. Nothing and no one can take that away. There area lot of well written posts here supporting you Melanie! I wholeheartedly concur with them. I’m sorry NatGeo did that to you and Gari.